Republican National Committee chair Reince Priebus called Sen. Harry Reid a "dirty liar" this morning on "This Week" for accusing presumptive GOP presidential nominee Mitt Romney of not paying taxes for ten years. "As far as Harry Reid is concerned, listen, I know you might want to go down that road. I'm not going to respond to a dirty liar who hasn't filed a single page of tax returns himself. 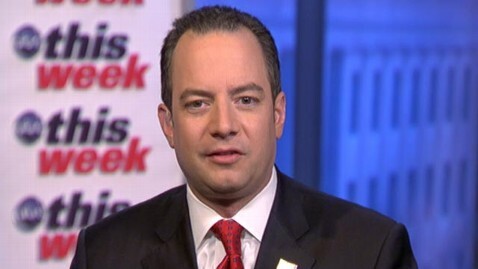 (He) complains about people with money but lives in the Ritz Carlton here down the street," Priebus said. "So if that's on the agenda, I'm not going to go there. This is just a made-up issue. And the fact that we're going to spend any time talking about it is ridiculous." Reid, the Democratic Senate Majority Leader from Nevada, said in an interview with the Huffington Post last month that, according to a source that called his office, Mitt Romney did not pay taxes for ten years. The accusation was strongly denounced by Romney, who said it was false and that Reid needed to "put up or shut up." Romney, the former governor of Massachusetts, has been under intense pressure by Democrats and even some in the GOP to release more tax returns. Romney has released his 2010 returns and an estimate for 2011. Democratic National Committee chair Rep. Debbie Wasserman Schultz, D-Fla., who appeared on "This Week" before Priebus, declined to criticize Reid and said that Romney could clear the air by releasing more returns. "I do know that Mitt Romney could clear this up in ten seconds by releasing the 23 years of tax returns that he gave to John McCain when he was being vetted for vice president. Or even 12 years of tax returns that his own father said were what was appropriate. Because one year of tax returns, like he's released, could just be for show," said Wasserman Schultz, who added that she does not know Reid's source. "Like the overwhelming majority of voters believe, because the polls all show, that Mitt Romney owes us more than one year of tax returns. Owes us answers to questions about his overseas investments, owes us answers to questions about why he's decided to invest in foreign countries, as opposed to investing in the United States." On the roundtable, ABC News senior political correspondent Jonathan Karl called Reid's accusations "outrageous." "It's one of the most outrageous charges that I've ever seen actually made on the Senate floor," said Karl. "He (Romney) paid taxes. It's a completely false charge. But Reid loves it. The Democrats love this. Because no matter how much he digs in, no matter how much he gets attacked, you know, here or by Jon Stewart, or anywhere else, it gets the story out there again and again." ABC's George Will compared Reid's actions to McCarthyism . "Look, in 1950, Joe McCarthy went to West Virginia, didn't know what to tell to the Women's Republican Club of Wheeling, West Virginia, so he said I have in my hand a list of 205, we think that are - 205 communists in the State Department. Didn't have a list. Harry Reid doesn't have any evidence either. This is McCarthyism from the desert," said Will. Former Counselor to the Treasury Secretary under President Obama Steven Rattner said the charge made by Reid was not "appropriate," but also wondered why Romney would not just release more returns to put the issue to rest. "I don't think it was appropriate. But you still come back to the question, why won't he release his tax returns? If he's paid all the taxes he says he's paid, he says he's paid a lot of taxes every year, why not just release them and move on? And end this discussion," Rattner said.